On the dashboard, click on the Metrics & Monitoring tab in the left hand column. Click on the Open Analytics Console to view analytics for past broadcasts. You can click on Live broadcasts to open analytics for a broadcast that is currently live. 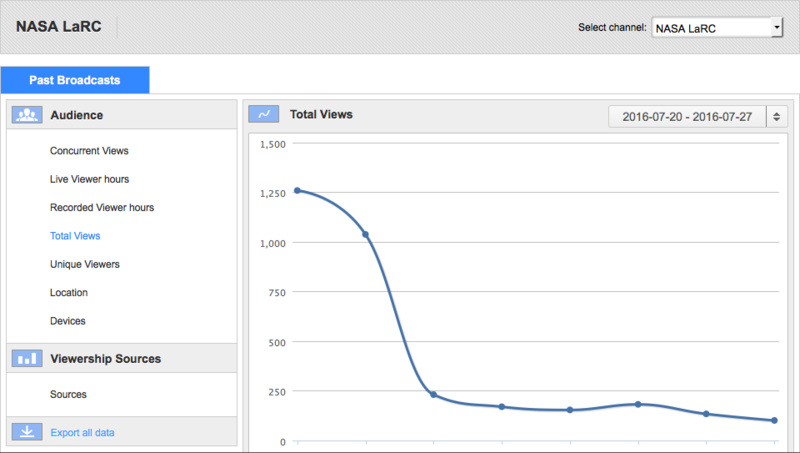 The channel you are currently looking at past analytics for is shown in the upper left corner of the page. You can change the channel using the dropdown menu in the upper right. Once you have chosen the channel you wish to view metrics for, you can choose the date range you wish to view from the date dropdown menu just below the channel selection menu. Concurrent Views: this is the number of simultaneous viewers you have on the stream at a given moment. Live Viewer Hours: this is the number of live viewer hours used in the date range selected. Recorded Viewer Hours: the number of recorded viewer hours used in the date range selected. Total views: this is the total number of times the channel's player has been opened in the date range selected. Unique Viewers: this is the number of unique viewers watching the stream during a given time period. Unique viewers are determined by a cookie placed in a browser upon first opening the player. Location: this shows a heat map of your worldwide or US viewership during the date range selected. Devices: this shows the number and type of browsers and devices used to view your stream. Sources: this shows the different domains that your stream is embedded in. Below the graph showing these different metrics is a chart showing the same information. You can choose to export the period and metric type using the 'export this period in CSV' link, which will download the data to your local drive at the granularity you choose from the right hand toggle. You can choose to export all data for that date range using the 'Export all data' link at the bottom of the left column. What's the difference between Concurrent and Total Views?